Karwar is a city in Uttara Kannada ( formerly North Canara or North Kanara ) district of Karnataka state, India. 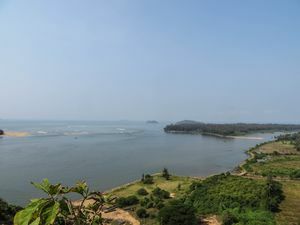 Karwar is the district headquarters of the Uttara Kannada district. 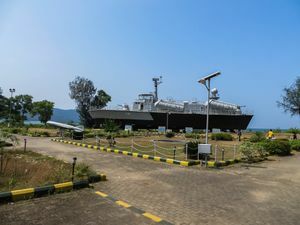 It houses the INS Kadamba (Sea Bird project), the naval base of Indian navy. It's a good getaway for a weekend or a great introduction to the state of Karnataka if coming from the north. You can fly to Dabolim Airport (IATA: GOI) (Goa) which is 97 kms north and take a taxi or go to Margao.From Margao there are trains and buses to Karwar. Devbagh resort is just 2 ½ hours from there. Pune Airport - Pune,Maharastra- 655 km. Mumbai Airport -Mumbai - 895 km. Mangalore International Airport at Mangaluru ,Karnataka which is 271 kilometre (km) distant from Karwara. Karwar is connected to Delhi, Mumbai, Ahmedabad, Mangalore, Cochin and other important places through the Konkan Railway. Most trains stop at Karwar; else one has to alight at Madgaon (Station code : MAO) (Goa) and reach Karwar by road.The journey between Mangalore & Karwar takes not more than 4 hours. Visitors from Chennai can enter via Mangalore. For details, kindly enquire with the Railway authorities. Travelers from Bangalore and Hyderabad should get off at Hubli and proceed by road to Karwar. A full list of the trains can be obtained by a search on IRCTC or eRail. Overnight deluxe bus services are available from Bangalore. Buses also ply between Madgaon and Karwar at regular intervals. There are local buses to Gokarna as well, so you can connect easily if going from Goa to Gokarna or back (but you may have to ask people where is the right bus, as, unlike in Goa, signs on the local buses are generally only in the local language, Kannada). The road between Hubli & Karwar, is one of the best in Karnataka and passes through thick jungle. There are state owned bus service from cities of Dharwad,Huballi and Mangalooru as well. You can get around Karwar by bus, auto rickshaw, or car - in increasing order of price. You can also rent a boat to visit some of the islands. For the environment-friendly, bicycles are also available on rent basis. Bicycles in the standard non-geared, and now MTBs are available with [Roshan Gonsalves, Karwar]http://www.cycloadventure.in/contact-us. Kannada is official local language which is used in government documents and signboards as well as spoken by many localites. Konkani and Marathi are also spoken by a few. 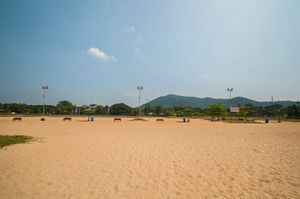 Beaches: The Rabindranath Tagore beach is right next to the highway, yet secluded. While it has nothing special, it's an ideal place to 'chill' for a few hours. Clean. Devbagh beach is an auto ride away and is beautiful, clean and partially private in nature. The war ship museum: Is quite a unique visit, which houses war memorablia. There's a small entry fee, and they will show you a documentary on the Indian Navy. The Aquarium: Very nicely maintained. Around 30 species of fish in clean aquariums, including piranhas. There's a large partial skeleton of a blue whale. Sadashivgad Fort: A dilapidated fort which is an auto ride away from the beach, has quite a nice view. 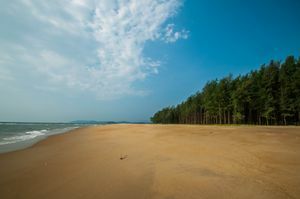 There are many beaches on the shore of Arabian sea in and around Karwar. Some of these beaches have water sports activities. Also a trip to nearby Yana rocks can be scintillating . The Anshi National Park also called Anshi tiger reserve is at distance of 51 km. The Sadashivgad Fort is a small while away. Karwar is not a shopping paradise. There are small pan stalls, chat stalls, and the regular apparel and electronic stores. There are plenty of places to buy fresh seafood from. Karwar has plenty of places to stay in on a budget. In the main town, a great place to stay is Aditi Comfortswhere you get a large service apartment for under INR 1000. There are plenty of other lodges and hotels in the city which rent rooms for sleep. Some of these hotels may have attached restaurants for breakfasts and dining. If you'd like to stay at Devbagh beach, Devbagh beach resort  is somewhat pricey but the beach is quite brilliant as is the nature walk they provide around the resort, through Mangrove forests among other things. Don't miss the Quicksand! Kumta - 75 kms from here. Honavar - 95 kms from here. Gokarna - 75 kmsfrom here. This page was last edited on 15 June 2018, at 09:55.